Billerica, Massachusetts-based Insulet Corporation, maker of the OmniPod Insulin pump, has just announced that it received the FDA clearance to commercialize its latest product the Omnipod Dash Insulin Management System. 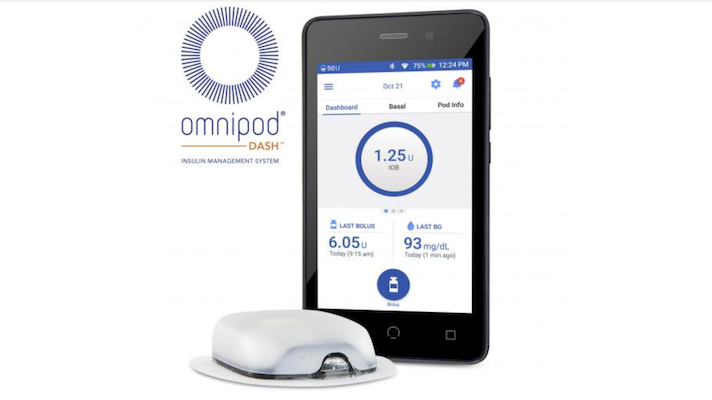 The Omnipod Dash includes a tubeless, wearable insulin pump that can continuously deliver insulin therapy through basal rates and bolus amounts, according to the company’s webpage. The Dash system also includes a handheld Personal Diabetes Manger with a touchscreen, which connects to the pod via Bluetooth technology. The technology also gives users access to the “Calorie King” food library that gives patients information about carbs in over 80,000 foods. Users can then connect their Omnipod Dash system to smartphone apps Omnipod Display or Omnipod View. The apps are designed to let users and caregivers see the patient's insulin therapy information. The Omnipod View lets caregivers and parents see their child’s diabetes information. The company also has technology, called the iOS Today View, that allows users and care teams to view their personal diabetes management information and continuous glucose monitor data on a smartphone screen. Right now the only blood glucose meter that the system is compatible with and can transfer readings wirelessly to is the Contour Next One Blood Glucose Meter from Ascensia Diabetes Care. The Omnipod Dash system first got the FDA nod in January but this latest announcement gives the company the ability to market and sell the product. Right now the company is estimating that the system will have a full market release in early 2019. The technology has been years in the making. In March of 2017, Sullivan referenced 510(k) plans that were submitted for a mobile app and Bluetooth-enabled PDM.